The Bath Sling with head support was designed for patients that are totally or partially dependent, non-weight bearing, bariatric (obese) or have limited head control. It has a divided leg design which is the most common used patient lift sling for most patient transfer situations. It is also the most common sling for bathing and showering applications because of its fast draining and quick drying mesh material. It can be applied or removed very easily while the patient is seated or in the reclined position. Is constructed with 6 positioning straps which provides a safe weight distribution of the patient while also allowing more flexibility in positioning the patient in the sling. Can be used for transfers from a bed to a chair, wheelchair, or toilet, chair to chair or from the floor to a bed or chair. 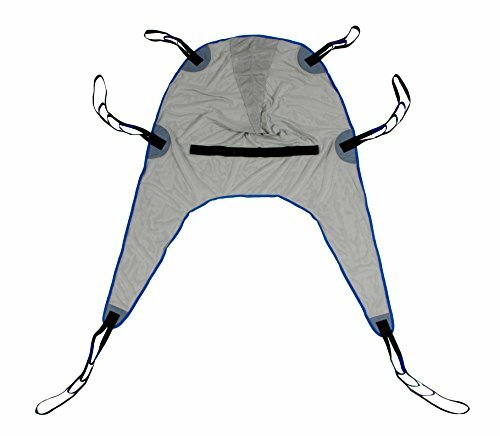 Made with a soft polyester mesh fabric which provides comfort, protects the patients with sensitive skin and prevents the patient from sliding while in the sling. Size (Small). The 450lb weight capacity allows the mesh bath sling to accommodate a wide variety of different size patients and their specific needs while providing good back and thigh support. Size (Small) - Recommended weight range of 90-145lbs. 1 Year Warranty.